What was becoming a remarkable investigation spanning two years, had covered Peru, Ecuador, Bolivia, Colombia (and was to be followed by Brazil). The man hauling his video cameras down the aircraft steps had been attacked twice, but had infiltrated deep into the heart of the South American circus industry where we filmed a cruel trainer beating his dogs, and poor Indiano the elderly lion being beaten and kicked. Bolivia was to be followed by Colombia to conclude this investigation. Some cameras were now held together with tape, but within days we were recording life inside Bolivia’s animal circuses. And so the evidence was gathered: Monkeys in tiny little crates and cages; a lion cub that never once left his small cage; lions living on the backs of lorries; pregnant lionesses forced to keep performing and even jump through rings of fire. These are the things that will be no more in Bolivia. Back in London we began processing the evidence, writing the reports, preparing leaflets and posters, and editing the video. Our South America team were meeting with local campaigners, drawing together the Stop Circus Suffering campaign partner organisations for the launch of the investigation. Press conferences took place with our campaign partners, Asociación para la Defensa de los Derechos de los Animales (ADDA) and Educación y Bienestar Animal (EBA); our Stop Circus Suffering DVD was screened in the Department of Environment in Cochabamba and in Santa Cruz. The shocking footage was screened on most major television channels and shown in bars and restaurants, as well as newspapers and radio. Campaigners, individuals and campaign groups all over Bolivia joined in and everyone played a part in moving towards the ban as leaflets and information poured out. Information was distributed to the relevant authorities and prominent figures in various cities. 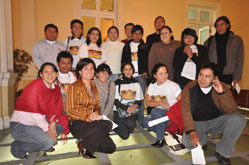 In Cochabamba, ADI turned up the heat, lobbying and staging demonstrations outside the Mayor’s office. Soon after the local bans were enacted, ADI saw an opportunity and drafted a proposal to ban wild animals under a Presidential Decree on biodiversity. Despite almost a year of negotiations the proposal failed to materialise. We picked ourselves up and started again. For the Bill to become a law it had to pass through both Houses; the Chamber of Deputies (upper house) and the Senate (lower house). Two readings were held in each; the first in the Commission of Sustainable Development and the second in the Plenary. Therefore, the Bill had to be read, debated and voted favourably four times. After several unsuccessful attempts, on 14 January our team in Bolivia and Congresswoman Flores got the Bill on the agenda of the Commission of Sustainable Development in the Chamber of Deputies. However, the annual recess was upon us! This meant that our team had to race against the clock to get the Bill approved in the Commission and in the Plenary of the Chamber of Deputies on the same day. The Bill was approved in the Commission with minor amendments. Even Deputies who initially expressed concerns, voted favourably. On 14 May, the Senate’s public gallery was full of supporters wearing ADI T-shirts and holding banners as the Bill was debated and approved, with some minor amendments, including allowing one year for implementation (by comparison with other new laws, a very rapid phase out); also the words “and similar” [shows] were excluded from the prohibition. On 20 May the amendments made by the Senate were approved unanimously in the Chamber of Deputies. 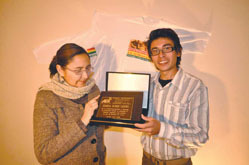 The new law was then sent to President Morales for the presidential assent and Law 4040 was signed on 17 June. This is strong and courageous piece of legislation and it was important to commend the Bolivian Government. ADI Chief Executive, Jan Creamer, presented the Bolivian Ambassador in the UK, Beatriz Souviron, with the first Toto Award for services to animal protection, which acknowledges President Morales and the Bolivian Government’s progressive stand. ADI’s Juan Pablo Olmos also presented an ADI Award to Congresswoman Ximena Flores commending her initiative and hard work to secure the new Law. ADI continues working with Congresswoman Flores; now drafting regulations to implement the law and with the national environment authority on a census of circus animals and relocation strategies. 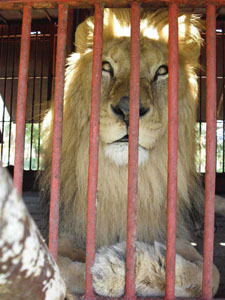 Already, six lions and a baboon have been handed over to ADI for rehoming. And above all else, thanks to our individual supporters who enabled us to put field officers into the circuses in Bolivia, to make DVDs, to publish the reports, produce campaign materials, send people to lobby politicians. Come on UK and Europe, let’s see some action!